You’ve decided that you want to buy a new mixer, but found yourself overwhelmed by all the options that are available. From classic workhorse models to top of the line mixers, there are so many models to choose from, it’s hard to know what you really need. We’ve taken a look at some of the top-selling models across the spectrum of power and prices, and put together this buyer’s guide to help you find the best stand mixer for your cooking style, counter space, and budget. We’ve graded these mixers on versatility, performance, user-friendliness and design. Whether you’re looking for the best KitchenAid stand mixer, or want to choose one of the best stand mixers under $100, we’ve got you covered. The remarkable KitchenAid KSM155GBCA 5-Qt. Artisan Design Series with Glass Bowl earned our top ranking, thanks to both its performance and design. This tilt-head stand mixer offers a 5-Qt. glass bowl with convenient measurement markings, which provides more than enough capacity to mix the dough for at least 9 dozen cookies or 4 loaves of bread in a single batch. The mixer comes with a beater, hook for dough, a pouring shield, and a 6 wire whip; as a bonus these accessories are completely dishwasher-safe. The mixer's power hub also lets you customize it to your needs with 15 additional optional attachments, allowing you to tackle virtually any cooking project you can imagine. The 59-Point Planetary Mixing Action provides 59 touch points per each rotation throughout the entire bowl for an impressively thorough fusion. The super sleek tilt-head design will allow you easy access to both the bowl and the attached beater to check if everything's mixed, or to add more ingredients. Whether you are blending wet and dry ingredients together, kneading sticky bread dough or simply whipping cream, the KitchenAid KSM 155GBCA Artisan mixer is perfect to tackle any job. Our other favorite feature of this mixer is the vast array of colors to choose from. 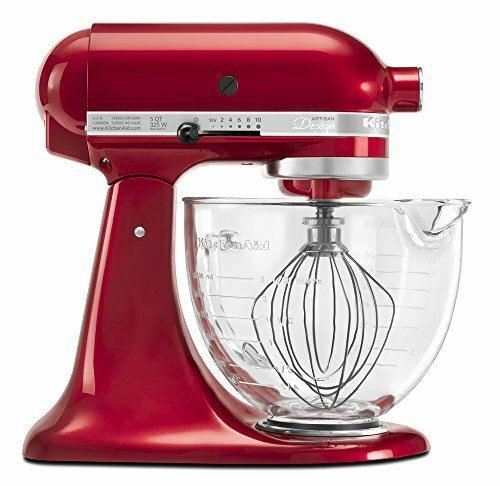 Whether you prefer classic and understated, or something bright and modern like the candy apple red, these mixers let you match both your kitchen and your personality. It's not the cheapest mixer on the list, but with all this model has to offer you-- between power, added accessories, and the selection available-- this mixer absolutely lives up to the old adage "you get what you pay for". The KitchenAid K45SSWH Classic Series Stand Mixer is exactly what it says: a classic. This kitchen workhorse has 10 speeds, and at 250 watts is strong enough to handle almost anything you ask of it. The 4.5 quart stainless steel bowl will give you enough capacity to make up to 6 dozen cookies or three loaves of bread. It comes standard with a wire whisk, dough hook, and flat beater, and the hook, beater, and bowl are dishwasher safe for easy cleanup. This is an impressive mixer and a great addition to most kitchens. The only areas where it can't outcompete its Artisan Mixer cousin are at the upper limit of power and bowl size requirements, and in color selection available. 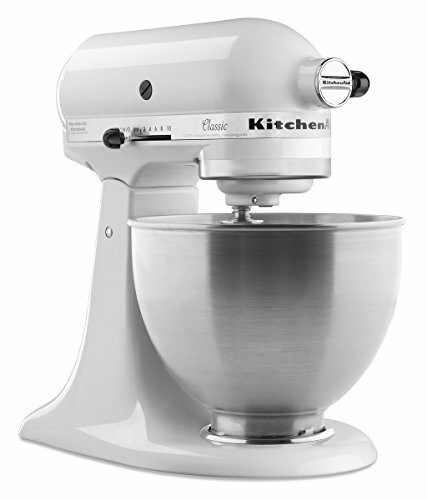 For an every day home cook who likes a simple classic, this mixer is a great choice. A great choice for every day hands-free mixing, the Hamilton Beach 63325 6-Speed Stand Mixer is our top choice for a stand mixer under 100. Whether you're looking for fluffy egg whites, or trying to mix a sticky bread dough, this mixer will meet the challenge. Planetary mixing action gives better bowl coverage than traditional 2-beater stand mixers, keeping you from having to scrape down the bowl. A special fold setting lets you add dry ingredients on the fly without having them end up all over the counter, and a splatter shield helps prevent messy drips and spills. The head tilts up for easy access to the 4 quart bowl, and the bowl and all attachments are dishwasher safe. Non-slip feet help keep the mixer in place as you increase your speed and power demands up to the maximum this 300 watt mixer can provide. Impressing family and friends with homemade baked goods is something we'd all love to do, but mixing and cleanup take time, and we don't all have the space for a big mixer. The Sunbeam 250 watt 5-speed hand and stand mixer combo can help with all of that and take the stress out of baking with ease. If storage in your home is an issue, this stand mixer is the perfect solution due to how incredibly compact it is, and it weighs less than 10 lbs. Our favorite part of this mixer is that with the simple press of a button, the stand mixer converts to a hand mixer, adding versatility and making it perfect for whipping up fluffy mashed potatoes or just quickly blending some wet or dry ingredients. The durable 3-quart stainless steel bowl can easily be removed from the base for fast and easy clean-up. The set also includes two chrome beaters and two dough hooks that are dishwasher safe. This incredibly versatile mixer will aid and assist you in preparing endless batches of all of your and your family’s delicious treats quickly and simply. KitchenAid is one of the world’s most trusted brands in terms of top of the line kitchen products. Keeping that in mind, it's no wonder that when it comes to high end mixers, KitchenAid goes above and beyond the standard limitations of products available to home chefs. The KitchenAid KP26M1XNP 6 Qt. Professional 600 Series Bowl-Lift Stand Mixer is certainly a professional-grade product. At 575 watts of mixing power, this mixer will handle anything you ask of it. The advanced 67 point planetary mixing action will keep your bowl clean without you having to scrape, and the 6 quart stainless bowl lets you mix up to 13 dozen cookies at once. The bowl also has a convenient handle to let you easily hold the bowl while removing your dough. The mixer comes with a bowl lift, rather than a tilt head, and is available in a wide variety of colors to match your kitchen. This top of the line KitchenAid stand mixer is a great investment for a home cook who wants a powerful, multipurpose mixer. With our stressful and busy lives, when it comes to cooking and baking, who would not appreciate having some additional help in the kitchen? If that sounds like something that you would like to take advantage of, the Sunbeam 2371 MixMaster is most definitely a great product to consider. This lightweight, everyday mixer helps take the stress and annoyance out of your prep work to make your time in the kitchen more enjoyable. You can use this mixer for virtually anything that you are interested in baking or cooking. From daily tasks such as baking pizza on school nights to mixing everything you need to make pancakes on Sunday morning, or mixing the batter and whipping the frosting for a birthday cake, the Sunbeam MixMaster Stand Mixer is the perfect addition to any kitchen. The Mixa stand and hand mixer is one of the very few mixers of which offers an actual twin motor. What is a twin motor system you ask? To explain simply, it is one motor that runs the beaters while the other motor takes care of rotating the entire bowl. The Mixa’s exceptionally unique design also allows removal of the mixer head, giving you a super powerful hand mixer. The Mixa grants over 325 watts of total power allowing you the freedom and capability to take on even most heavy mixing tasks. Not to mention the fact that the Mixa also boasts 10 speeds and a power boosting button and also the 2-speed mixing bowl motor ensures completely efficient mixing of a wide variety of ingredients. The mixing bowl also includes a snap-on lid and the specially designed “V-groove” beaters literally aerate your mixtures far better. The Mixa package includes stainless steel beaters and dough hooks, as well as a cleverly designed spatula which fits the profile of the bowl perfectly and even has an extended tip which makes beater scraping super easy. Regardless of how often you seek to utilize a mixer, frequently or just occasionally, the Mixa is a wonderfully convenient and price effective solution to fit your needs and desires in the kitchen. Regardless of whether you consider yourself to be a master chef or simply a hobby baker, with a CHEFTRONIC 6-Speed Kitchen Electric Mixer you will be able to take full control of your baking and cooking needs while saving yourself a ton of hassle, time and elbow grease as well. The tedious task of kneading dough for bread or pizza is a thing of the past with the CHEFTRONIC mixer, as this excellent mixer is more than fully capable of kneading, whisking, creaming, folding and tons more. The mixer offers three varying beater adjustments, as well as a translucent splash guard which helps you to significantly cut down on undesirable kitchen messes. Thanks to that combination, you'll spend significantly less time on both tedious mixing and cleanup. The CHEFTRONIC stand mixer brings a generously sized 5.5-quart mixing bowl which allows you to make signficantly larger amounts in a single batch. The dominantly powerful motor and sturdy quality of manufacturing come together to create the perfect kitchen appliance for all of your mixing needs. One of the finest features of the Bosch Universal Plus Stand Mixer is just how incredibly compact and lightweight it is for the power it offers. In spite of the small footprint, the mixer comes with an extra large 6.5-quart plastic bowl, which is also BPA-free and dishwasher safe. The powerful 800 watt motor is up to the challenge of mixing a stunning 14 loaves of bread at once. 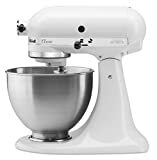 The remarkably powerful belt-driven transmission gives you the power you need, while the large mixing bowl gives you the capacity to make up to 34 dozen cookies in one single batch, perfect for your child’s upcoming bake sale. The Bosch Universal Plus Stand Mixer even comes complete with a wide variety of various optional accessories and attachments that are sure to transform your new mixer into the perfect kitchen assistant. The wide array of attatchments grants you the incredible opportunity to be able to grind meat, juice fruit, make fresh homemade pasta, and so very much more. The Bosch Universal Plus Stand Mixer comes complete with wire whips, a plastic whip drive, a dough hook, and a 2-piece pouring shield with a lid. Dual beaters offer triple whipping action, for something as small as a single egg white, or large as up to 10 pounds of potatoes. The remarkably powerful belt-driven transmission also ensures to provide you with more than adequate torque for virtually any recipe that you may seek to achieve; including the full-on capability to knead up to 14 loaves (which is the equivalent of 15 pounds) of whole grain bread dough or even mixing upwards of 34 dozen cookies in one single batch, perfect for your child’s upcoming bake sale! The Bosch Universal Plus Stand Mixer even comes complete with a wide variety of various optional accessories and attachments that are sure to transform your new mixer into the perfect kitchen assistant. What other mixer on the market grants you the incredible opportunity to be able to grind meat, juice fruit, make fresh homemade pasta, and so very much more. The Bosch Universal Plus Stand Mixer comes complete with wire whips, a plastic whip drive, a dough hook, and a 2-piece pouring shield with a lid. The stunning Cuisinart SM-70 7 quart 12-speed Stand Mixer certainly offers more power and capacity than most competing mixers. To start, the Cuisinart provides you with an incredible and all-powerful 1,000-watt motor which can more than handle even the heaviest mixing tasks with ease and simplicity. The powerful motor is housed in sturdy and durable die-cast metal. The mixer comes with an extra-large, seven-quart stainless-steel bowl of which can more than accommodate large batches, including double or even triple recipes. The mixer also provides twelve various mixing speeds, and even a super handy 15-minute countdown timer with an automatic shutoff, to guarantee the maximum precision in your mixing. The mixer's tilt-back head allows for super easy access to the mixing bowl and makes attaching the extra accessories simple and easy. Some of the accessories included with your purchase of this Cuisinart mixer are a chef's whisk, a flat mixing paddle, a dough hook, as well as a useful splash guard. The whisk is fabulous for aerating in order to increase the overall volume of your mixture, and it can also be utilized on the slower speeds in order to gently combine all of your dry ingredients. The bottom and sides of the bowl are nicely contoured which also allows for much easier access for the flat mixing paddle as it ensures complete and thorough mixing of all of your ingredients. The convenient dough hook plus the incredible power of the motor help ensure hand kneading is a thing of the past. Not to be forgotten, the splash guard provides a highly useful extra-wide spout for easily pouring and adding more ingredients, and helps prevent messy spills and splashes. The Cuisinart stand mixer also comes complete with three power outlets, including a super fast speed outlet, for optional attachments that let you take advantage of the mixer's powerful motor. The attachments, which are sold separately, include a meat grinder, a citrus juicer, a blender, a food processor, and even a pasta maker. The stand mixer measures 15 ½”x11”x14 ½” and comes with a handy three-year product warranty, as well as a five-year motor warranty. Choosing the best stand mixer does not have to be an overwhelming or annoying task. The easiest way to proceed with making your purchase is to take some time to write down or think about which features you are best looking for in a mixer. Ask yourself these questions: are you more of a baker who is seeking to mix thick doughs? Or are you more of a cook who is just seeking to add a bit more assistance in the kitchen when it comes to mixing up some mashed potatoes for dinner once in a while? How often do you imagine that you will be using your mixer? And finally, how much are you willing to invest in your mixer? These are all important questions to reflect upon prior to making your final mixer purchase. We’ve made our best suggestions above for a variety of budgets and cooking needs, and it’s advisable to take the time to do your research when it comes to making the final decision of which mixer is going to be the best option to fit your needs and desires in the kitchen. The following are the best tips for what you should take into consideration when you are ready to invest in a new kitchen mixer. As we mentioned above, the first thing that you should take into consideration are your personal and unique cooking needs. To start, stand mixers are utilized for far more than simply whipping up batches of your favorite breads and baked goods. With the proper attachments, you are capable of creating an abundance of various foods. Purchasing the optional attachments that many mixers offer grants you the capability to be able to make meatballs, pastas, butters, raviolis, tamales, and so many other recipes that may have previously seemed entirely too complex or just plain tedious. Be sure to take into consideration both what you would like to make as well as how much you’d like to make at a time. The next tip we can offer is to do your research on pricing options. It’s possible to find a mixer to fit nearly any budget, from a college student just starting out to “the sky is the limit”. When it comes to mixers, as in anything else, you should of course always remember the age-old slogan of “you get what you pay for”. When looking for standard hand held mixers, you are able to easily find many really great options for significantly under $100. However, with hand mixers comes the extra elbow grease that is required to stand and maneuver the mixer yourself. This is precisely why so many are opting to invest a bit more in order to get a stand mixer and obtain that “extra hand” in the kitchen. If you do opt for a hand mixer, either due to budget or space requirements, consider the weight, since you’ll have to hold it. At the same time, realize that a super-lightweight hand mixer probably won’t have the same mixing power as a heavier one. Of course, no hand mixer is going to outcompete a heavy duty stand mixer, when it comes to sheer mixing ability. With stand mixers, there is quite a wide price range as well. You can find quite good basic stand mixers for under $100, and for some home cooks this may be ideal. High powered mixers are also typically in a higher price range, but these are great choices for anyone who makes a lot of different recipes of which require a ton of heavy-load mixing. Dense bread dough can be a real test for a lighter weight or underpowered mixer. When you make bread often, you may well find yourself wishing you’d bought a stronger model. If a heavy duty mixer this sounds like what you’re looking for, you should also seek out a mixer that has a bowl with enough capacity to make larger batches at one time. A mixer with a wide variety of speeds will also allow you different options in terms of precision for the various types of foods that you are planning to make. If you feel like you’re on the fence between the two, you might consider a convertible, stand to hand, mixer. Several of the models we reviewed above give you the option to use the mixer on its stand, or remove it and use it as a hand mixer. This can be a great choice when you see good things about both options and don’t want to limit yourself. It’s also nice for a smaller kitchen, if you don’t want to store both a hand and stand mixer. Weight is another significant factor that you will want to consider when it comes to selecting your new mixer. Especially when it comes to hand mixers, be sure to select a mixer that is easy and light to hold for a significant duration of time, as this is precisely what you will have to do, particularly when making larger batches. Interestingly, when it comes to stand mixers, the exact opposite is usually what you’ll want to look for. The heavier a stand mixer is, the more sturdy it is while it mixes up your recipes. This can be tricky, however, as you will want to find a mixer that is steady and strong so that it is not bouncing around your counter while mixing a heavy bread dough, but you will also want to find one that is light enough that you can handle it with relative ease. Weight also becomes a factor depending on where you plan on storing your mixer. If you plan on using your mixer quite frequently, you may want to keep it on your counter, and depending on your counter space this may be convenient or less so. If you must keep your mixer in a cabinet, you will want to be sure that it is not too hard to lift as this may lead to it becoming an inconvenience and in the long run, you deciding that it is simply not worth the hassle of getting it out. A good weight target for a stand mixer is one that weighs about 20 lbs or just under as these tend be the best at staying stable while they are mixing thicker doughs. With lighter types of models you may risk them moving around your counter, which means that you will have to keep a sharper eye on your mixer, and may not have the freedom to take advantage of the time that you could be doing other things. Similar to weight, you will most certainly have to take into consideration the overall size of the mixer. There are two main things to consider when it comes to size: How much space do you have available in your kitchen? And how much food are you planning to make with your mixer? Typically, you can find a wide array of different sizes available on the market and, as may be expected, typically the prices do go up as the models get larger. If you plan on baking for larger groups and you have the space, you may seek to invest in a bigger kitchen mixer which is far more likely to make your life easier, and you can guarantee that the cost will certainly be worth it. If you are planning on mainly cooking for a small family, you may be able to happily make do with a small or medium sized mixer model. Speed settings are also vastly important to consider, as different types of foods will require different speeds of mixing. The vast majority of models in terms of both hand and stand mixers offer several speeds, typically anywhere between 3 to 12 different speed options. Every mixer has some form of a slow setting, which of course makes it much easier to add ingredients to your mixtures without making a huge mess. They should additionally include a faster setting for making such things as meringues or whipping up cream. While it’s possible to create any number of recipes, providing that the mixer has at least three different speed options, if you are more ambitious in the kitchen and want to mix with the most accurate precision, opting for a model with more speed setting options could really pay off. When it comes to using your mixer to its fullest potential, you will most certainly want to invest in standard attachments. The good news is that many mixers come with several standard attachments, just be sure to double check before you buy. For most home cooks, there are three basic attachments to consider. A dough hook is an attachment that is typically in a spiral shape or a c-shape that is utilized for whipping up virtually anything that will require kneading, such as pizza dough and bread. A wire whip, or “balloon whisk”, is used to create the finest homemade whipped cream, frostings and meringues. Finally, there is a flat beater that is easily the most commonly utilized attachment, as it is the simplest go-to selection for cake batters, cookie doughs, and even mashed potatoes. While the aforementioned attachments are the most commonly used and highly trusted for all of your kitchen needs, there are also many other attachments that can be found on the market to suit any of your kitchen needs or desires. These attachments include, but are certainly not limited to; pasta rollers, ravioli makers, slicers and shredders, juicers and sauce attachments, ice cream makers, food grinders, sausage stuffers, vegetable and fruit strainers, and even grain mills. If you believe that you may be interested in investing in more attachments as time passes, it is important that you purchase a stand mixer that can be compatible with any attachments of which you may be interested in, and has the power to run them. Yet another thing that you may seek to consider is just how easy the actual cleaning process of your mixer is. Let’s face it, we have enough to do in the kitchen as it is, with regards to the actual cooking and cleaning process. Which is precisely why hand mixers are often the top earner of points with regards to the cleaning category when compared to stand mixers. When it comes to stand mixers, one typically will wind up with a lot of different separate pieces that they must to clean. While the vast majority of attachments are completely dishwasher safe, you will still find that other attachments must be washed by hand every time that you use your mixer. Maintenance is something else that you will have to consider. Keeping this thought in mind, you should most certainly do some research on the mixer that you are planning on investing in. Read reviews and product recalls to ensure that you are making the best decision that you possibly can make for the investment of your new mixer. It is most certainly always expected that some minor amount of maintenance for the majority of stand mixers is inevitable, however, some may prove to be a bit more difficult than others. This again is where reading reviews can come into important play as you can quite often get a very good sense about which mixers will give you far more trouble when you are cleaning and maintaining them than others might. When it comes to the noise level of kitchen mixers, regardless of how you look at it, you will find yourself dealing with some amount of sound. In other words, you will not be able to find a mixer, hand or stand, that is completely silent. While most standard hand mixers are not too significantly loud, any electric mixer is going to make a certain amount of noise, and of course, there are some certain models of which are far louder than others. With that being said, if you are particularly sensitive to loud noises, or maybe have a new baby in the house, then you should take a look at which mixer models the reviewers mention as being noticeably quieter. And finally, we come to the selection of the color of your mixer model. Whatever your stylistic preferences may be or whatever the theme of your kitchen is, you are sure to find a variety of color options available for virtually any mixer that you seek. While some of the cheaper models only come in one or two colors, the majority of the top of the line brand mixers offer a wide range of vibrant colorful selections. Whether you are simply sticking to the standard white or black model or going for the ever popular red, or perhaps a fresh spring green, you are sure to find the perfect color to suit your needs as well as complete the look of your kitchen’s space! There is a huge abundance of mixers available on the market today, and regardless of which type of mixer you are seeking, be it a hand mixer or a stand mixer, you are sure to find the perfect one that offers everything you are looking for and more. The best stand mixer can most certainly transform who you become in the kitchen. You can go from grumbling as you mix mediocre cookies to creating the best desserts, breads and pastas in no time flat! An extra helping hand in the kitchen is something that everyone could use and would more than welcome, and if you choose the perfect mixer for your needs, that extra helping hand can become a reality. A good, trusted and reliable mixer is most certainly going to prove to be a worthwhile investment for you. And again, it is most definitely a product where you will get exactly what you pay for. Be sure to put in the time to research the aspects that matter most to you, while additionally utilizing this buyer’s guide as a great resource to get you started in kicking off your mixer selection journey. Take care in doing your research, never be afraid to read reviews and ask questions to get better answers. No one likes paying a ridiculous amount of money for a product that not only does not suit their needs, but ends up becoming another daunting and stressful chore to deal with in the long run. The best advice that we can give is to simply sit down with this buyer’s guide and a piece of paper. Jot down precisely what you are looking to get out of your mixer and ask yourself the questions: What am I going to use the mixer for? What am I seeking to get out of the mixer? How much am I planning on investing? Would a stand or hand mixer be the best fit in my kitchen? Where am I going to keep the mixer? How heavy and big is the mixer that I am interested in? From here, you will best be able to jumpstart your search in finding the best possible mixer that you are sure to love and use for many years to come!